The Rice Ranch, also known as the RRR-H Ranch, encompasses 1,546 acres of land in the breathtaking northern New Mexico San Juan Mountains. 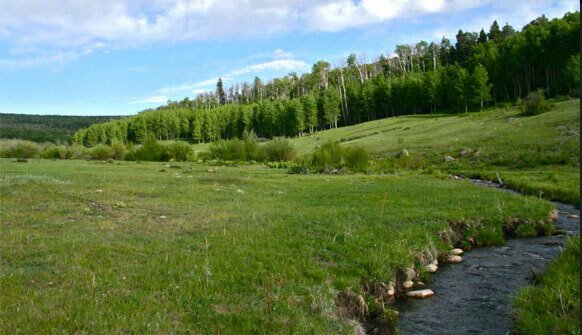 Set against a backdrop of wildflower covered alpine meadows, ponderosa pines, spruce, gambel oak and aspen woodlands, the Ranch is truly a recreational and big game hunters' paradise that can also be operated as a working horse or cattle ranch. Big Creek Properties does not provide real estate brokerage services. The properties that are offered "for sale" or "for lease" on this website are from our portfolio of real estate owned properties of affiliated companies and trusts. Please feel free to contact us if you have any questions or would like additional information. The information provided herein is deemed accurate, but is subject to errors, omissions, price changes, prior sale, lease or withdrawl. Big Creek Properties, its owners, brokers and agents do not guarantee the accuracy or completeness of any information related to the properties, and provides such information without warranties of any kind. Please verify all information when evaluating our offerings.